I have been wanting to read Rebel of the Sands since I heard of last June when I bought it. 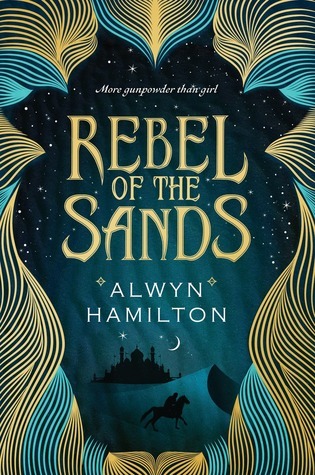 I give Rebel of the Sands by Alwyn Hamilton four out of five stars. I enjoyed myself a lot with this novel and found the story very funny and interesting. The setting was really interesting and kept me on the edge of my seat. It has been awhile since I read a book that I had so much trouble putting down. I wanted to finish it and took every opportunity to read. The characters were mysterious at first and as Amani, the main character gets to learn about these people you get surprised by them and by herself for that matter, because together with her you learn things about her even she did not know. Jin is one of those mysterious characters. He comes into Amani’s life when she tries her luck at the shooting competition. He recognises her when they later meet for who she is even though she does not know it herself. But he has a secret of his own. He is funny and witty. He also knows how to hide his true identity. Rebel of the Sands is a must read for everyone who wants to be swept up by the desert winds and taken to a far away place. This entry was posted in Book Review and tagged Adventure, Alwyn Hamilton, Book Review, Fantasy, Romance. Bookmark the permalink.